For more information about Rehab Without Walls or hippotherapy call Robyn Moug at (509) 710-9825. Arms outstretched like an airplane, Trey Henning, 6, beamed as he rode around the paddock. He sat astride Monte, a beautiful brown American quarter horse, looking like he’d been born to ride. As Monte began to trot, Trey tipped his head back in bliss, savoring the movement and the September sunshine. She’d brought Trey to this paddock near Deer Park to work with his physical therapist, Robyn Moug, director of clinical management for Rehab Without Walls in Spokane. Moug is a clinical specialist in hippotherapy. This unique therapy pairs specially trained horses with patients, to increase hip and pelvic range of motion, strengthen the trunk, and provide valuable, effective sensory integration, among other benefits. Every aspect of Trey’s time with Moug and the horses is therapeutic. He started his session by grooming Moug’s two miniature horses. Working the brush through the horses’ long manes helps his fine motor skills. When it was time to mount Monte, Moug had Trey take side steps to the horse. Once astride, he adjusted his body to the rhythm of Monte’s gait. 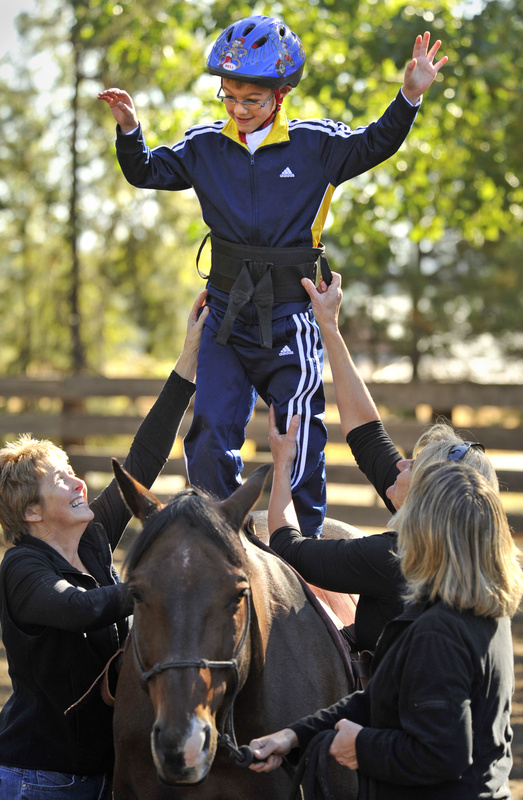 He stretched his arms above his head as he rode, an exercise that is fun for him and an important way to improve his balance. Part of that difference is simple motivation. Trey loves the horses and looks forward to his sessions. His parents watched while Moug and her assistant helped Trey stand atop Monte. Well-trained horse handlers called side-walkers are an integral part of each session. Those who doubt hippotherapy’s benefits might do well to watch Moug and the horses work their magic on 10-year-old Ryan Sonneborn. Sensory integration issues make the transition from one activity to another difficult. Ryan steadfastly refused to grab his walker and moved toward Toby, a Norwegian Fjord owned by Robin Pearson, the main horse handler for the program. Moug coaxed him into movement by softly singing “Row, Row, Row Your Boat” while walking him toward Toby. Consequently, he missed all of his developmental milestones. He didn’t eat solid food until 4 and didn’t begin to crawl until 5. When finally atop Toby, Ryan still didn’t seem too pleased until his first slow circle around the ring. Suddenly, his agitated movements stopped – his tense body relaxed and a huge grin split his face, as he lifted his head toward the sun. As they circled the ring, Ryan engaged Moug in a game of peek-a-boo, grabbing her hands and putting them over his face repeatedly. Moug positioned Ryan so he faced backward on the horse and after awhile Toby’s gait so soothed Ryan that he laid his head on the horse’s broad back and closed his eyes.